Rent Farallon | Corporate Events | Wedding Locations, Event Spaces and Party Venues. An underwater fantasy. Sustainable seafood. Smart wine list. 5 star service. Now celebrating 18 years as the premier dining destination in SF. Join us. Since opening in 1997, Farallon has garnered national acclaim as a top dining establishment in the heart of San Francisco’s Union Square. The classic restaurant and bar captures the life aquatic with carefully crafted details and a menu that features fresh seafood and simple raw preparations, rounded out with local produce, meat and game. Recognizing the demand for large parties, Mark Franz and Pat Kuleto have created 3 private dining rooms above the restaurant in the historic Elks' building that houses the restaurant, Kensington Park Hotel, and the Post Street Theater. The design of the private dining rooms is a continuation of the underwater theme in the restaurant. The private dining rooms are serviced from their own kitchen under the direct supervision of Executive Chef Ryan Simas, and Chef/Owner Chef Franz. The private dining menus change seasonally and we are always happy to design a special menu for your event. a hand-blown glass aquarium, candlelit fireplace and a wine library. 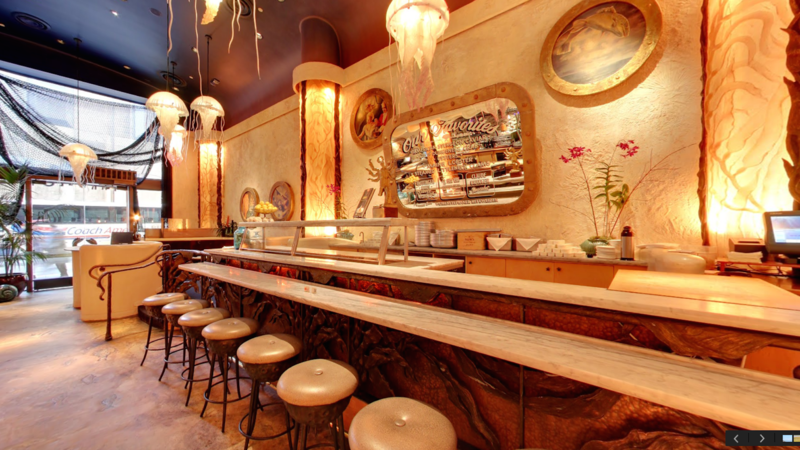 OSTERA ROOM - With its 10-foot French windows overlooking Union Square, the Osetra Room seats up to 32 guests. Beautiful porthole paintings are the perfect accent to this room. BELUGA ROOM - The largest of the 3 private dining rooms, the Beluga room seats up to 96 guests. French doors lead you to a grand ballroom of a luxury ocean liner inhabited with all manner of sea life. WINE HOLD - Table seats a maximum of 12 guests and is surrounded by 4 glass walls. The table is located in the Pool Room of the restaurant. Your guests choose from our daily changing a la carte menu options.